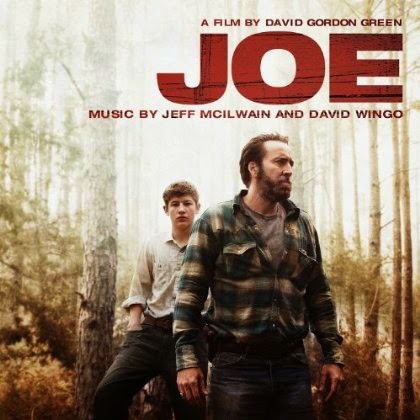 Based on Larry Brown's acclaimed novel, Joe from David Gordon Green (George Washington, All the Real Girls) tells the story of a hard-living ex-con (Nicolas Cage) who becomes friend and protector for a hard-luck kid (Tye Sheridan). As Joe, Cage delivers one of his best performances in a storied career. He is as compelling as he is in his most outrageous roles, but achieves the effect with far more restraint here. And, as Gary, Sheridan, who followed The Tree of Life with Jeff Nichols' Mud and now this film, continues to prove himself one of America's most subtle young actors. The music to this contemporary Southern Gothic tale is by David Wingo (Ola Podrida; Take Shelter; Mud) & Jeff McIlwain (Mud, The Sitter); it beautifully captures the tension between the characters and blends the marks left by a lifetime of violence; tentative warmth thrashed by indisputable ferocity. It's a score that brings to life... well a life, this man's struggle to be just left alone... it's filled with some very low tones that I believe helps move this story along. It's worth it!